Has it already been a year since I wrote about how KFC gave $1 to the Juvenile Diabetes Research Foundation (JDRF) for every half-gallon Mega Jug of soda purchased by customers? This year, it's Wendy's turn. 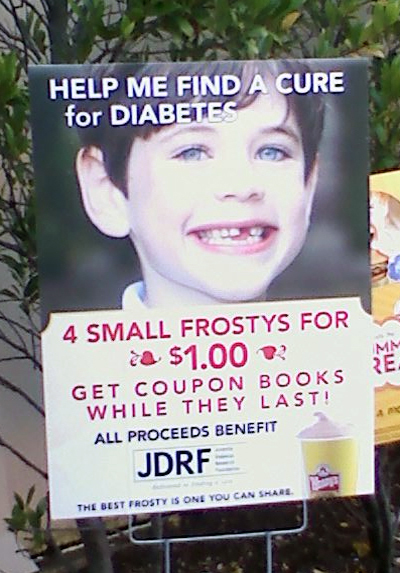 Donate a dollar to the JDRF, and the fast food chain'll give you coupons for four small "Frostys" -- Wendy's sugary ice cream treat. Because hey: One can never have enough Frostys, especially when diabetes research is on the line.